No one who gets into a vehicle, whether as a passenger or driver, is guaranteed safety. Automobile accidents are simply an unfortunate risk of the road. Although the risk for a collision is always there, there are factors that increase the odds of a car accident. As a group, teens are roughly four times more likely to crash than those from any other age group. Although teens make up about 10 percent of the population, they are involved in around 12 percent of annual car crashes. 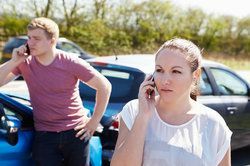 Experienced car accident lawyer, Lynn Harris, discusses the actions and decisions that put teens at an increased risk for collisions and accidents. An automobile accident has consequences for all involved, including the driver of the vehicle, passengers in the vehicle, and drivers and passengers of other cars on the road. Besides damage to the vehicles involved, people involved in collisions are likely to suffer injury as well. Injuries from car accidents can range in severity, and may even result in death. Automobile accidents are actually the leading cause of death in teens between the age of 15 and 20. Many of the actions taken by teen drivers can be classified as reckless or negligent behavior, both of which can be used to determine fault in an automobile accident. For those involved in an accident due to the reckless, negligent, or inexperienced driving of a teen, our Salt Lake City auto accident attorney can help prove liability and assist in the collection of any due compensation. Depending on the types of injuries suffered and the consequences of those injuries, victims (either passengers or drivers of another vehicle) may be able to collect compensation for medical expenses, lost wages, and pain and suffering. Depending on the circumstances, punitive damages may also be rewarded in order to hold the driver further responsible for their negligent actions. Personal injury attorney Lynn Harris can ensure that your rights are represented in the case of an automobile accident. If you have any questions or are interested in learning more about your rights, contact us at your earliest convenience to discuss your case. We look forward to hearing from you.